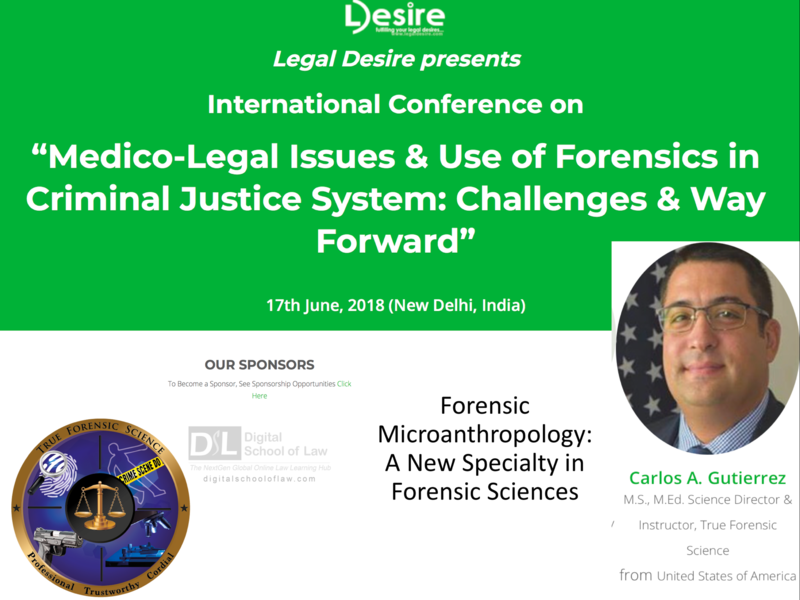 On June 17th, 2018 True Forensic Science’s Science Director, Prof. Carlos A. Gutierrez, participated as speaker in the International Conference on “Medico-Legal Issues & Use of Forensics in Criminal Justice System: Challenges & Way Forward” hold by Legal Desire in New Delhi, India. Due to at the time of the Conference Prof. Gutierrez was offering a series of Seminars in different countries of South America, he could not be present at this important event held for the first time in India. Nevertheless, given that Prof. Gutierrez’s main purpose is to share his discoveries as much as he can, especially with experts from countries where improving and/or updating their crime investigation methods is critical for lowering their crime rates, he decided to participate through videoconference. More than 100 people attended Prof. Gutierrez’s Seminar “Forensic Microanthropology: A New Specialty in Forensic Sciences”, who had the privilege to learn for the first in India about this interesting new area of Forensic Science, which was presented to the forensic science community in the U.S. only 2 years ago. Not only the participants had the opportunity to learn about Forensic Microanthropology, but also to directly interact with Prof. Gutierrez who answered all attendees questions in their first approach to this interesting new field. During this 30-minutes-seminar, Prof. Gutierrez taught attendees that after getting the proper training in Forensic Microanthropology methodology, any forensic scientists, regardless their backgrounds, could be able to analyze under microscope small pieces of evidence found and determine whether they are bone or not? And, once it has been determined as bone, define whether it is human or non-human bone? By using this evidence processing method, many Forensic Labs can avoid subject all undetermined piece of evidence to the expensive and hard-to-get DNA analysis. Forensic Microanthropology comes to play its transcendent role when Forensic Anthropology is unable to provide un answer due to the evidence condition. Additionally, attendees could learn that Forensic Microanthropology analysis can provide an answer as fast as 24 hours and can cost as little as USD$30 per evidence; an overwhelming difference in comparison with Forensic Labs’ current option, DNA analysis, which results can be obtained between 3 & 8 months after, and cost in average USD$1,000 per evidence. Prof. Gutierrez’s participation in this Conference, was possible thanks to the collaboration of True Forensic Science (USA), which is proud to have been one of this important event sponsors.